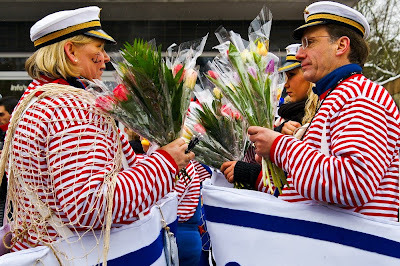 We were not in Cologne for the big Rosenmontag-Umzug this year. We did that once and learned that it is too crazy for us to try to do with small children. After all, we aren't all Rheinländer. 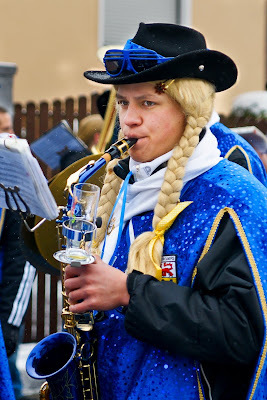 But we went to two smaller parades, one in Overrath and one in Rösrath. 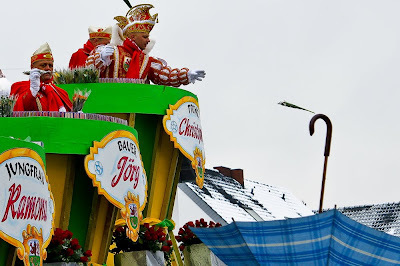 It snowed on both days, but at least it didn't piss on our parade as it did last year! The only drawback was that the candy that was thrown from the floats ended up in the slush around our cold feet. The other day a neighbor's child was trying to tell us about a piece of music by Saint-Saens that she heard in concert once. 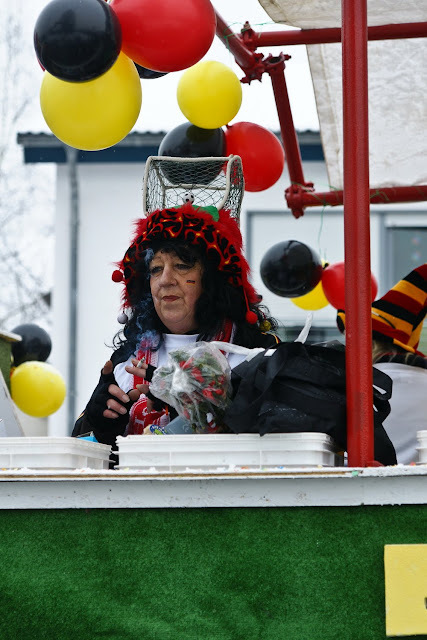 She called it "Fasching der Tiere", confusing the Rheinland word for Carnival (Karneval) with the southern German term Fasching (or Fastnacht/Fasnet). 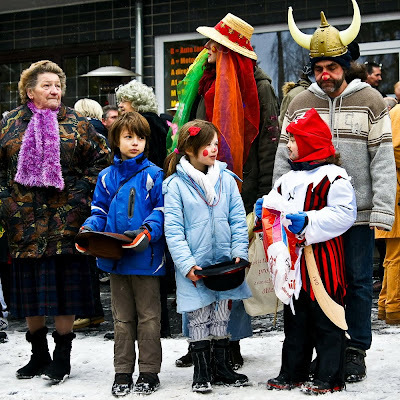 In any case, Karneval (and Halloween for that matter) is the wrong time of year for kids to dress up so that others can see their costumes and yet still be warm. Here you see a couple of attempts. About all that remains are a hat and some face-painting. 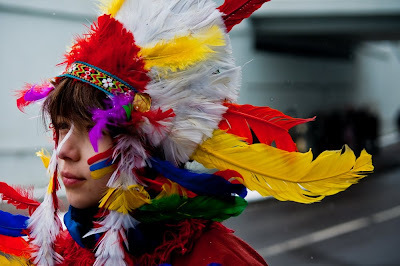 It takes a great amount of experience and cajoling to find a costume for a child that he likes and that he will be warm in during a two-hour parade. 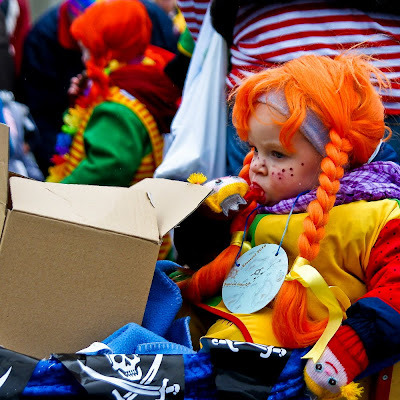 The parents of the child below did a good job, although I don't think the little Pippi had much to say about her costume. She was riding in a wagon that served to tote all the extra candy as well. Aside from "Kamelle" (candy), you can also call for "Strüßje" (Strauß, a bunch of flowers). I felt a bit like a loud beggar every time I yelled "Kamelle", especially since I didn't really want the Turkish chocolate or bags of sweet popcorn. 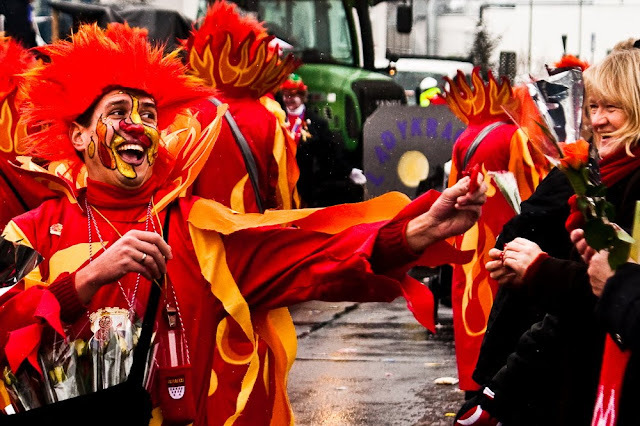 The kids and other real Rheinländer had no problem calling out to the people in the parade. There is a type of light beer that is drunk a lot in the Cologne area, "Kölsch". As with most types of alcohol, the glass from which you drink it has a special shape. As fate would have it, the glasses are small and fit nicely in your hand - or in a little holder that you can attach to your saxophone! This boy threw down at me six little pieces of hard candy, two packs of gummi bears, a Mars bar, a piece of unidentifiable Turkish chocolate and a pack of Kleenexes to clean up with. 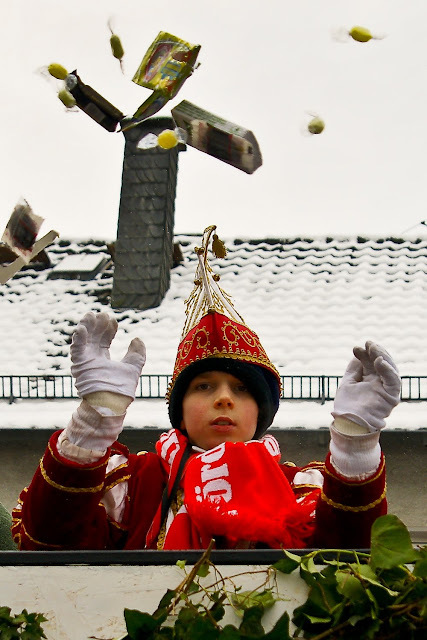 In southern Germany, this would have been an average haul from an hour-long parade! 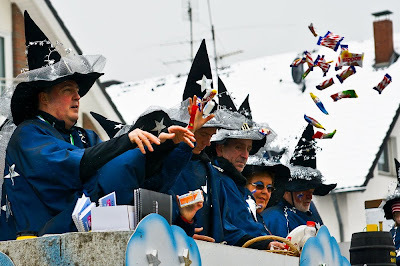 These witches and warlocks threw calendars and handfuls of Nippon chocolate-covered rice cakes and other goodies. No wonder we came away with 18 bags of sweets from the two-day spectacle! The "Dreigestirn" (three stars) of the parade ride in the last float, the virgin, the farmer and the prince. 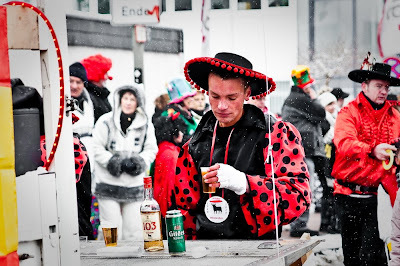 Traditionally, they are all three men because they have to have a lot of endurance during such long parades and during the intensive weeks leading up to Karneval. If you look closely at this picture, you will see some interesting details. First, the three stars throw lots of flowers. Bianca learned the hard way when we were in Cologne 10 years ago that if you dress like an evil witch, you don't receive many flowers; they are reserved for the princesses. Second, the three stars are surrounded by boxes of chocolate samplers which they throw down to people they know. They wouldn't be elected to their positions if they didn't know a lot of people in their towns; thus, they need lots of big boxes to share among their people. Last but not least, I saw several people this year use upturned umbrellas to catch the goodies. Great idea? When I did that in Villingen (southern Germany) 13 years ago, Bianca told me that wasn't done ("Man macht das nicht!" - the sentence most used in disciplining other people in Germany). Of course, politics play a large role in the themes chosen for the floats. I saw one about Tiger Woods shooting a hole in one. And there were lots about communes not having enough money. The upcoming World Cup in South Africa was also a big theme, with a song "Africa here we come" being blasted from speakers all day long. This woman has a little goal with a pendulous soccer ball on her head. This torero may not have heard about the ban on glass bottles at the parade. There is no ban, however, on drinking alcohol at the parade. And when you've drunk a lot of beer, you have to get rid of it. We were standing at the edge of a building that many people ran behind to relieve themselves. Some costumes were not cut out for a quick drop o' drawers. On a gray day it is nice to see such bright colors lining the streets. 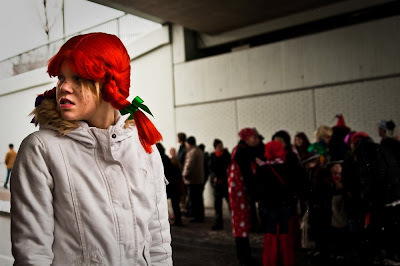 This little Pippi Langstrumpf was standing next to us in Overrath. She didn't seem to be been affected by the jolly spirit that had infected the other onlookers.